Chimpanzees share roughly 94 percent of their DNA with humans, though they still need to borrow a voice. 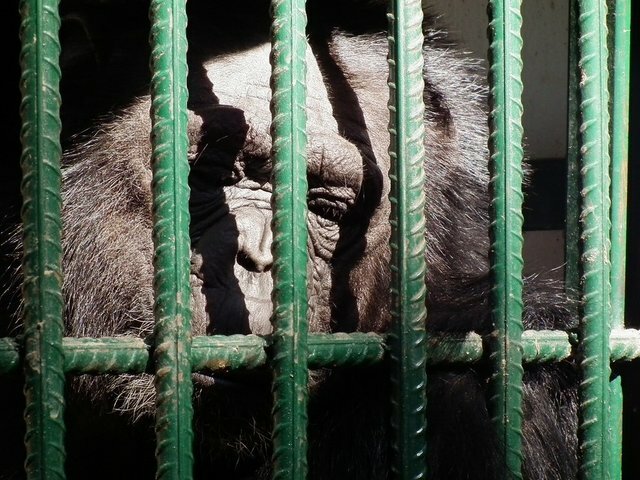 For the first time ever, a lawsuit has been filed in New York on behalf of a captive chimpanzee -- urging that the animal be granted the most basic protections of personhood. The suit alleges that a pet chimp, named Tommy, is being held against his will by reindeer farmers Patrick and Diane Lavery, confined to "a small, dank, cement cage in a cavernous dark shed" on a property in Gloversville, NY. Isolated from the companionship of chimpanzees, Tommy's only connection with the outside world is provided by a television set installed within his cold enclosure. Nonhuman Rights Project, the organization filing the suit, cites the writ of habeas corpus -- Common Law which requires those keeping a person captive to show legal justification for imprisonment. In the suit, the group's lawyers argue that Tommy, and other chimpanzees, are deserving of those same protections and should be allowed to live in a more natural state on the grounds of a wildlife sanctuary. While our legal petitions and memoranda, along with affidavits from some of the world's most respected scientists, lay out a clear case as to why these cognitively complex, autonomous beings have the basic legal right to not be imprisoned, we cannot, of course, predict how each of the judges in the three county courts will respond. Later this week, Nonhuman Rights Project will file similar suits on behalf of three other chimpanzees held captive in New York, a move which, if successful, could open the door for similar lawsuits around the country. "Our goal is, very simply, to breach the legal wall that separates all humans from all nonhuman animals," the group writes. "Once this wall is breached, the first nonhuman animals on earth will gain legal "personhood" and finally get their day in court - a day they so clearly deserve."